Here are this week's group of my Ohio Collection blocks. I figure I am about 2/3 of the way finished with the blocks that I have planned for this quilt. The problem is that I really don't have enough blocks yet to sew a section together. This block is called Ohio Rose and measures 18". Birds in the Air - 12". Oak Leaf and Reel is also 12". This isn't my favorite block. If this one doesn't fit in the quilt, I'll add it to my bag of orphan blocks. We were away on vacation last week, and I've spent this week catching up on things and trying to get back into some sort of routine. I started off the second night home by opening the sliding door out onto the screened porch to make sure the screen was latched. That set off the alarm, woke everyone up, and the alarm company called and said they had a sensor reading that the patio door was open. There's nothing that gets your heart pumping quite like the sound of that alarm when you think you are being so quiet. I bought a few flowers to plant in my containers and have been doing that this week. Here is the view on the way to my front door. Everything except the pot on the step in the photo above is a perennial and had been planted last year. These are Knockout Roses. I found something on Pinterest that said to plant something thrilling, filling and spilling when planting a container. The thrilling (supposed to be something tall) is the spike plant, filling is different values of pink geraniums, and the spilling is the vine. It's early so time will tell. Here are more geraniums on the deck in back. Some coleus in the shade of the screened porch. I need to get busy and make some things for the porch. I have a few ideas. I've been spending some time sitting on the porch glue basting hexagons. I'll save those for another post. I hope you are finding some time to do a bit of stitching today! Here are my Ohio Collection quilt blocks for this week. This is the Tree of Life. I love how this Cherrywood hand dyed fabric looks in the tree trunk. These are 1 inch squares that will be used as filler somewhere in the quilt. Star and Crescent. I English Paper Pieced the diamonds and appliqued' them down. Then I added the crescents. See what Karen, Lori, and Cathy have worked on this week. Nancy has her top put together. I'm fortunate that I am able to sew in the car (while my husband drives). I know a lot of people are bothered by the motion, but I spent some time looking at the pretty scenery and some time working at adding the six set in pieces to my six pointed stars. Here are 3 of my favorites from this last dozen that I've finished. It seems to be taking longer to fill in the diamonds surrounding the stars than it did to do the stars themselves. It won't be long until I can put all of these together into a top. When I get back home, I'll have to see how many I've finished so far. Here is the view from my deck this morning. I'm looking at the Smoky Mountains while I have my coffee and do a bit of stitching. I hope you are finding some time to stitch today, too. Here are this week's blocks for my version of the Ohio Collection quilt by Anita Shackleford. This block is Star Spangled Banner. It measures 21 1/2". Instead of using all templates as shown in the book, I made the half square triangles using Thangles. I think it makes my piecing more accurate. The top points are still there at the top. Somehow I chopped them off in the photo. This rooster was drawn by Karen Log Cabin Quilter. The rooster is one piece, and I embroidered the detail on him. He measures 10 inches square. This block is called Periwinkle. It finishes at 4". I hand pieced this block. Bears Paw - another 12 inch block. These four 6" Sweet Gum blocks combine to make one large block with spacers in between. Be sure to visit Karen, Lori, Nancy and Cathy to see their progress on their quilts. I finished sewing the setting diamonds on these stars on the bus trip to and from Paducah. There's a lot of visiting that goes on during these trips, but during quiet times I always stitch. Here are my stars to date. I still have a lot of these six pointed stars basted and ready to sew. I'm not sure how many blocks there will be in this quilt. I am just really enjoying the fussy cutting and sewing these stars together. Here is my "loot" from the Paducah bus trip. The grab bags are from the Cherrywood booth. I wasn't quite sure what I would do with these, but someone said applique' .....so I bought two! The Petra Prins/An Moonen book is just full of inspiration just like most of those published by Quiltmania. Also while I was on the trip, I did my part to help support the Boy Scouts. They call this "the works". They sell this every year in Paducah, and it includes a piece of shortcake, ice cream, fresh sliced strawberries all topped with whipped cream. It tasted even better than it looks! Here are the last of the Paducah quilt show quilts. I forgot to schedule this to post to my blog. I've posted this Phebe quilt before, but the maker Mayleen wrote me to tell me it was her quilt. I'm so glad that she did because this quilt is just beautiful. 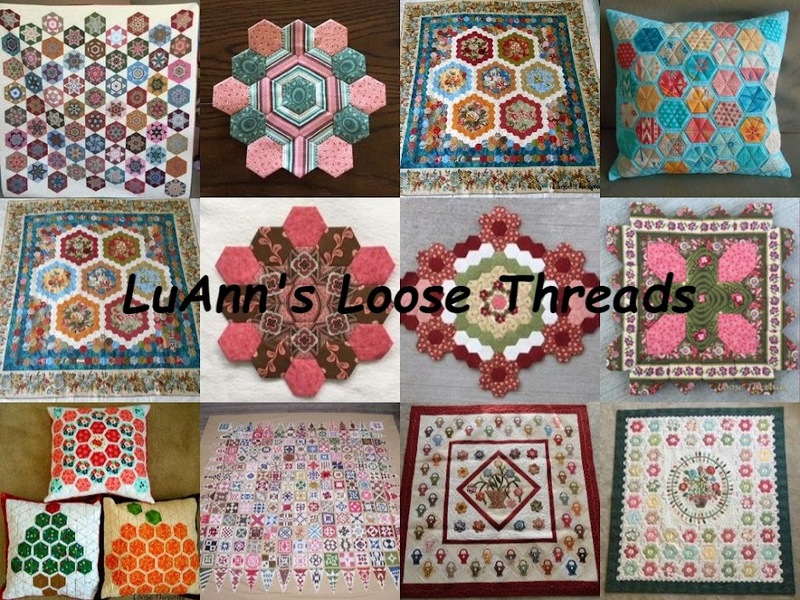 If you go over to her blog, Q is for Quilt, you can see more detailed photos of her quilt. She has embellished her applique' with embroidery. It's just beautiful. Here are this week's blocks for my Ohio Collection quilt. This block is Hollyhock Wreath. All of my applique' is needleturn, so it takes awhile to do my blocks. I do enjoy doing my quilts that way, and I feel that I have more control over where my stitches go. This is Sunburst. I used a block called Spinning Sun from Electric Quilt and removed a few lines to do this block. I used my Cherrywood hand dyed fabrics to do this block, and have actually cut into a few of them to do blocks for this quilt. This is my Variable Star remake. I wasn't happy with the other version because there wasn't enough contrast in the center. This was my first version. My blocks are based on patterns from the Ohio Collection book with substitutions from the Album Quilts of Ohio's Miami Valley book. Karen has drawn several blocks from that book and generously shared them with the rest of us. You can purchase the Ohio Collection book from Anita Shackleford's website. The Sue Cummings book can be purchased from Amazon. You can see the rest of the blocks for my quilt here. You can also see Karen, Lori, Nancy and Cathy's blocks as they work on their version of the Ohio Collection quilt. Here are some of my favorite quilts from the Paducah quilt show. I love feathered stars and kept coming back to look at this one. I love this one because it uses more traditional fabrics. I think anything with stars is great. Another nice pieced quilt with traditional fabrics. This show stopper is by Kevin the Quilter. This looks like colorful QR Code, and I love it. Kevin had quite a crowd of people huddled around his quilt. I had to wait quite awhile for them to clear out so I could take this photo. This quilt is by Theresa of Fabric Therapy blog. I know she has worked long and hard on the applique' and hand quilting of this beautiful quilt. This quilt is by Linda Hrcka and Lisa Bongean. Linda blogs at The Quilted Pineapple, and her machine quilting is beyond beautiful. And, you can find Lisa at Primitive Gatherings. Love the 30s and the quilt design. I always love to see a Phebe quilt. I have no idea how this one was done, but it looks so realistic. I did ask about taking photos at each stop before taking any of these. I explained that I like to put them on my blog, and they said that it was fine. There are photos from the Rotary Club Exhibit which were mostly the antique hexagon quilts, There are some photos there from the Hoffman Challenge, too. There are also photos of more of the quilts from the quilt show, wall hangings upstairs as well as the Wicked Cherrywood Challenge. There are also photos of my Shipshewana Retreat. If you look at the bottom right of each folder of photos, you can click on view album, That way you can see all of the photos and not just the ones that are displayed on the screen. There is also a slideshow button so you can just sit back and watch. We stopped at three different churches for our meals. Some of the quilts and photos are from those stops. Enjoy!